By the way he moves his hands in smooth, practiced gestures, you can tell Masashi “Mike” Oshita is a gardener. His digits are nimble, calloused, and dexterous after Years of work. They’ve spent countless hours plucking errant pine needles from patches of moss, sweeping away grains of dirt from carefully plotted stone walkways, and tweaking the delicate leaves of thin Japanese Maples. Though slight, their movements are easy to see at the moment, as each finger appears two feet long projected onto a vast white screen. Oshita stands by a table at the front of a handsome ballroom in Day Hall at the Atlanta Botanical Gardens. Facing an audience of roughly 50 people, he’s demonstrating the proper methods of stone placement, according to the principles of Japanese gardening, by positioning and rearranging three irregularly shaped stones in a small white basin filled with sand. He’s delivering a lecture and workshop detailing the history and techniques of the ancient art form, which he’s exceptionally qualified to present. Oshita is one of just 65 officially certified and classically trained Japanese gardeners living in the United States. With his home in Weaverville, he is the only such expert to work primarily in North Carolina. And while Japanese gardening has yet to achieve the stateside popularity of its flashier horticultural cousins—bonsai, an art form that focuses on a single tree, and ikebana, a minimalistic style of flower arranging—interest in Oshita’s work has increased sharply of late, buoyed by a growing awareness among the region’s gardening community of the rare talent in its midst. 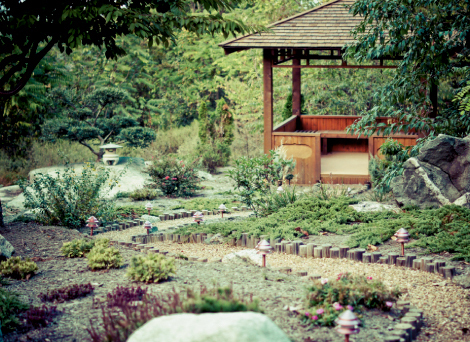 Born in Hiroshima, Japan, in the mid-1950s, Oshita immigrated to the United States in 1982 and settled in Weaverville, where he runs his garden installation business, Japanese Garden Service. He’s designed and installed more than 60 public and private Japanese-style gardens in North and South Carolina, including works at North Wilkesboro Community College, the Mint Museum in Charlotte, and the North Carolina Arboretum in Asheville. A thin man of medium height, Oshita sports the practical apparel of an outdoor vocation—neutral earth tones, button-up shirts with pockets over each breast, and plain work slacks that hang a bit baggy. He seems to have accepted the trappings of a landscape architect, but there was a time when he wasn’t so enthusiastic about working in the soil. In his teens, he left the farm and went to school to become an architect, spending summers working for his uncle, a professional Japanese gardener and bonsai master in Hiroshima. The work sparked Oshita’s interest, and, given a solid background in design, provided him a way to reconcile his latent admiration for the natural world with his strong creative and artistic inclinations. His future soon changed direction. Oshita withdrew from his studies in structural architecture and moved to Kyushu, the southernmost of Japan’s four main islands, to pursue a certification in landscape architecture. More so than in the West, gardening in Japan holds the status of pure artistry, and Oshita undertook multiple disciplines to round out his education. Along with planting and pruning techniques, he learned about Japanese tea ceremonies, flower arranging, watercolor painting, and bamboo work. The art form dates back approximately 15 centuries, according to Oshita. During Japan’s first cultural exchange with China in 607 A.D., a Japanese envoy crossed the sea to learn the ways of its neighbor, returning with two hugely influential cultural practices: formal gardening and Buddhism. Oshita’s demeanor and speech—calm, soft-spoken, and patient—hint at the type of personality one might expect from a man who creates environments intended for quiet contemplation. While his words are strongly inflected by the sounds of his native tongue, his speech bears a gentle delivery and casual, fluid rhythm. To apply the style outside the island country, though, there are few better places than the North Carolina mountains. According to Oshita’s presentation in Atlanta, Southern Appalachia, particularly in higher elevations, exhibits more than 150 genera with species closely related to Japanese flora. And the seasonal climates and hilly, rocky terrain are near matches to the conditions across much of the Japanese archipelago. Still, Oshita makes a point to appreciate the differences, too. “I like to use native plants, elements, and materials. I don’t want to bring those in from other places,” he says, adding, with the simplicity and straightforwardness of a Zen Buddhist koan, “I take what is there and apply the classical Japanese technique. And I make a garden."